Now in its fourth season, A Jewish Star will feature a panel of Jewish superstars to judge Jewish male vocalists as they compete online. A Jewish twist on a popular worldwide entertainment format that has swept the industry is coming to an Internet near you! 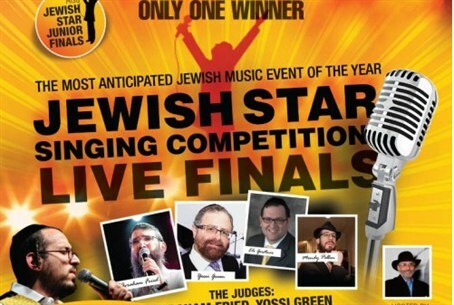 Jewish male singers are being invited to compete in a Jewish vocalist competition, with live auditions to take place in New York City next month. Combining two of today’s most popular genres – music and reality shows – the competition, A Jewish Star, has partnered with the National Council of Young Israel of America to bring entertainment and also a positive message to Jewish youth. This time the show is presenting its annual international Jewish singing competition in a reality show competition format. Jewish music superstarts Gad Elbaz, Lipa Shmeltzer, Yossi Green, Yehuda Solomon and Yeedle Werdyger will comprise the fourth season's panel of celebrity judges. The show will be hosted by the world-renowned Jewish comedian MODI, voted one of the “Top 10 Comedians” in New York City by Hollywood Reporter and BackStage Magazine. Contestants are invited to register through the show’s website and audition live in front of the judges on February 17 and 18 in New York City. Viewers can watch the live auditions as part of the reality show series, and vote online or via text message to help determine who will be the next Jewish Star. “Our goal is to provide a platform for talented individuals to shine, and to infuse new life into Jewish music so that it’s exciting again,” said Mica Soffer, executive producer of A Jewish Star. Filmmaker Danny Finkelman of Sparks Next studio will produce the singing competition’s fourth season as a 10-episode reality show, which can be viewed on the Internet. To register as a contestant, participate as a viewer, or vote for your favorite contestants, visit www.aJewishStar.com. Readers can also follow the latest news about the competition on its Facebook page.